Dr Sri Surya Kiran garu (1994-95) S/O Sri Satyanarayana Sir garu, our beloved Hindi teacher ZPHS D.Dharmaram. Are you interested to support this association? Thanks a lot for your interest in thinking about the young youth of D.Dharmaram village, please drop an email to email@ddharmaram.com, we will take care of the rest. 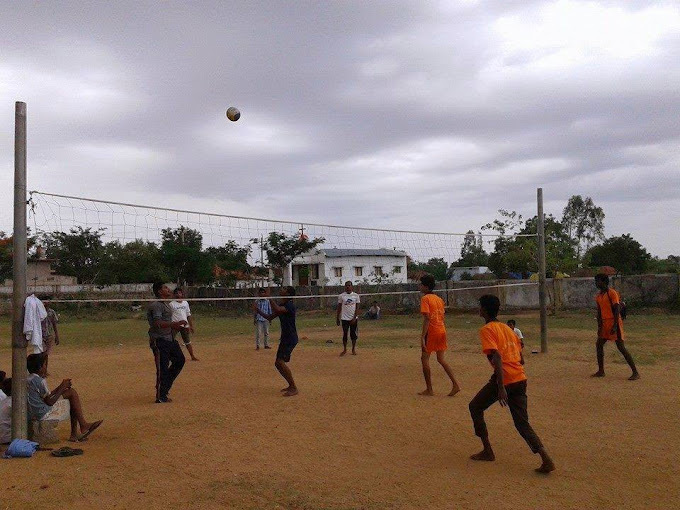 D.Dharmaram Volleyball Association is a village level sports group dedicated to improve, support, encourage the Volleyball game in the village of D.Dharmaram. The Association has started on 12th July 2014 by the well spirited young players of the D.Dharmaram village. Navateja Youth Association, 1996-1997 ZPHS D.Dharmaram old students, Sri. Siddaramulu, Sarpanch, Sri Shishylam an 1993-94 Volleyball player of ZPHS D.Dharmaram among the few who are supporting this Association in the village. There is a huge support from the community in and around of D.Dharmaram for this Association. 2012-13 students of ZPHS D.Dharmaram Represented Ramayampet mandal in 2012-13 acadamic year in the Medak District level Sports Tournament for Volleyball(Boys & Girls) and could able to defeat two other mandals in Medak district. D.Dharmaram village is having a rich history of great teams of volleyball. Under the great support and encouragement from Sri Venkat Reddy Sir, 1995-1996 ZPHS D.Dharmaram batch consisting of well known players of the village, Sri Kistaiah, Sri lachiah represented D.Dharmaram and bagged second position at taluka level tournament where about 25+ villages participated. Under the great leadership of Sri Venkat Reddy Sir, 1993-94 ZPHS D.Dharmaram batch represented ZPHS D.Dharmaram and shown an extraordinary performance, though it could not bag the cup in the taluka level tournament where about 20+ villages participated, it has attracted many students and youth of D.Dharmaram towards this game. 10. Every Year there will be Dharmaram Vollyball Tournament conducted starting with mandal level and the one team from dharmaram selected by the D.Dharmaram Volleyball Association will represent D.Dharmaram village and participant in the tournament. Sri Srishylam an 1993-1994, volly ball player, represented ZPHS D.Dharmaram at district level announced 100% Support for Dharmaram Vollyball Association. He is also willing to provide tips/help to players and conduct the Sunday matches at ZPHS D.Dharmaram school grounds. Sri Siddaramulu, the Sarpanch of D.Dharmaram expressed 100% support for this association and announced to formally inaugurate this association officially in very near future.